Home How are Tower Cranes Built? 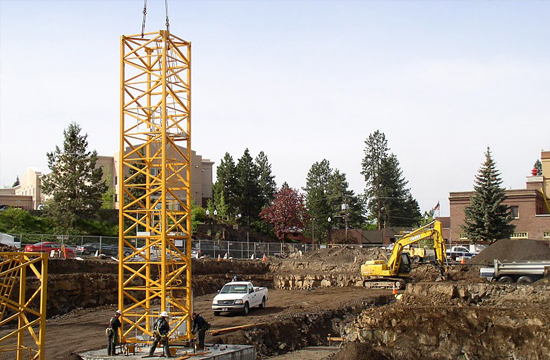 A Tower Crane Mast Section is set into a foundation with steel pedestals. The Mast Section is is plumbed to a degree of 1:500 (ie It must not deviate more than 1 inch from plumb for every 500 inches vertical) . Concrete is poured and then the crane is ready to be erected after the curing of the concrete. A 40’ Tower crane base is being set. 16 bolts are installed. The bolts have nuts that are 2 5/16” and are torqued with a hydraulic wrench to as much as 4300 ft lbs. By comparison, the lug nuts on most cars torque to 115 ft lbs. The process continues as mast sections are added until the needed height is achieved. The turntable (operator cabin included) is added in the same manner and is often the heaviest piece of the crane. In some applications this section is split to reduce weight on the mobile crane. This may add two hours to the crane erection process, so it is avoided when possible. After the Turntable is installed the Tower Top is added and four large pins are added as the connecting members. While the bolts on the Mast Section bolts are tightened, the jibs for the crane are assembled. The Counter Jib is erected as one piece. It is connected by large gates or pins at the turntable. After this connection is made it is elevated by the mobile crane to around 15 degrees above horizontal. The pendants are connected by pins with cotter pins. Then the Counter Jib is lowered to horizontal. Sometimes the Machine Package with Electrical Panel and Hoist is with the Counter Jib and other times it’s installed separately. After this, any needed Erection Ballast is installed in the Counter Jib. The Working Jib of the crane is installed at the turntable and elevated with the Mobile Crane. 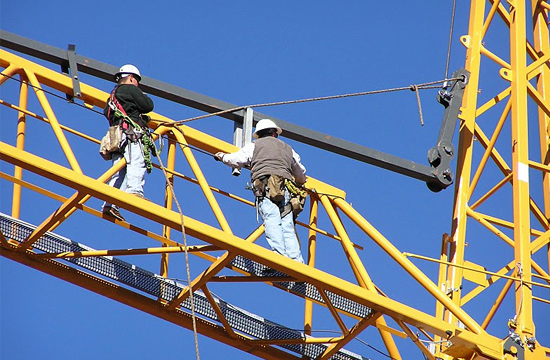 After it is elevated the Tower Crane hoist is connected to the pendant attached to the jib and pulled up to the Tower Top and connected with a pin. Then the Jib is lowered back to horizontal. The trolley is now installed if it wasn’t on the ground. The installation of the Outer Section of the Jib is installed with the installation of three pins. Finally the Ballast (up to 60,000 lbs) is installed on the Counter Jib and the structural erection of the tower crane is complete. In most cases this end of the first day. 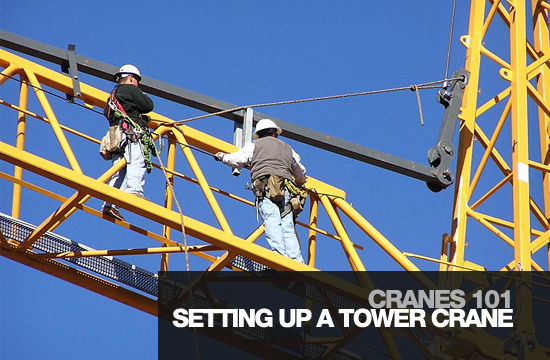 To make the crane operational, the ropes must be installed on the crane. The hook is moved along the Working Jib with a Trolley. Ropes are attached to the trolley and a winch. 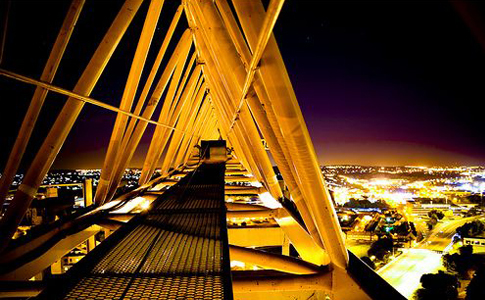 This work can take between an hour and three depending on the size of the crane and its design. The Load Line that hoists the rope is installed after the trolley lines. 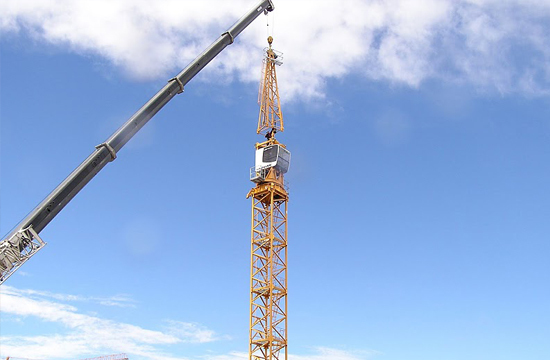 It runs from the back of the crane, through the tower top and out under the jib to the outer tip of the crane and is pinned in place either through a thimble or through a wedge and socket. If you are looking for the best payout casinos you can find over the web, you should focus on the perks they have for you. There are quite a few options at hand, but the site named before will help you find the top 888 poker casino you can work with so you can enjoy your winnings. 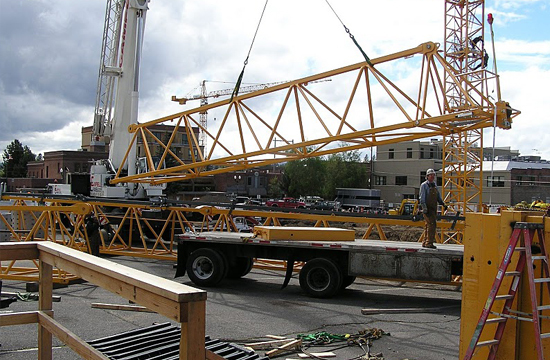 The entire process includes up to 13 trucks, can include seven crane erectors, three crane operators, two mobile cranes. 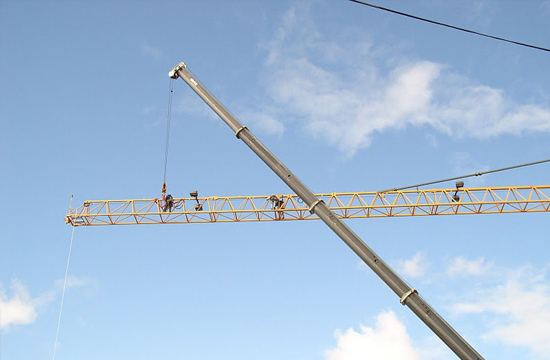 If no problems occur, most cranes can be erected in one day by a competent crew. The installation of the ropes and load testing can take up to a full day as well, but on small cranes, it can be done in the same day. 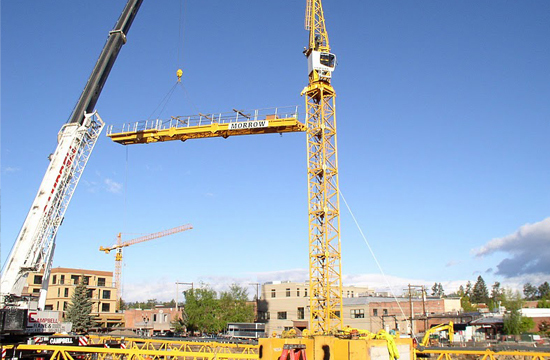 Erecting a tower crane costs range between $15,000 for the smallest of the fixed base cranes to over $60,000 for crane erections requiring large mobile cranes (Seattle Market Rates).